Release Date: May 11th, 2007 by Fox Atomic. The Cast: Robert Carlyle, Rose Byrne, Jeremy Renner, Harold Perrineau, Catherine McCormack, Imogen Poots, Mackintosh Muggleton, Idris Elba. BASIC PREMISE: Don (Carlyle) must save himself and his kids from being infected by the rage virus in District One, a U.S. military-controlled safety zone, while his wife (McCormack) becomes a carrier of the virus. 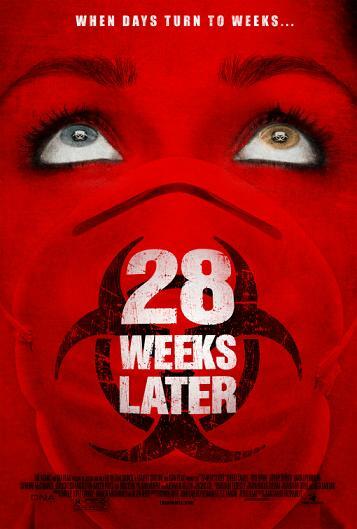 ENTERTAINMENT VALUE: 28 Weeks Later has enough actions, suspense and terrifying scenes to be immensely entertaining. Don survives an attack by a rage-infected victim which leaves his wife infected by the rage virus and presumed dead. He now looks after his two kids, Tammy (Poots) and Andy (Muggleton), and moves into a safety zone with them. The U.S. military remains on the lookout for anyone infected or entering an infected zone, such as Tammy and Andy, who decide to go check out their home. When they discover their mother is still alive but carrying the rage virus, that’s when the bloody mayhem truly begins. Not only do they have to worry about getting attacked by the rage-infected victims, but they might get killed by the military. If only the rage virus could be simply cured by anger management. One of the best scenes is when a helicopter flies low to chop up the rage victims with its blades. In terms of plot or character development, there aren’t any real surprises or memorable characters, but at least you won’t find any unintentionally funny scenes. Co-writer/director Carlos Fresnadillo keeps the action scenes coming at a fast pace and includes plenty of icky gore, a few terrifying jolts along with stylish cinematography that will surely keep fans of 28 Days Later thoroughly satisfied and thrilled. IN A NUTSHELL: A terrifying, thrilling and suspenseful ride. A highly satisfying sequel.